Two meetings in one week with a strong emphasis on the learning health care system – an indication that ideas are taking hold. The first plenary session, ‘Taking stock of the learning health care system: What have we achieved and why does it matter?” highlighted the issue with four speakers, two from PCORI, one from UnitedHealth Group, and a fourth from CareMore/Anthem. The session was full, and many of us listened from the overflow room. 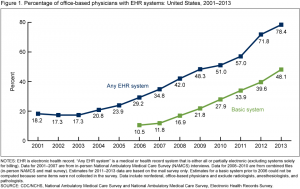 Penny Mohr (PCORI) presented this encouraging graph showing adoption of electronic health records (EHRs) by physician offices since 2001. Held over a three day period last week, and live streamed, this was only the third annual Stanford Big Data in Biomedicine Conference, and it was sensational. They closed with a session on Learning Health Systems, and featured four speakers: Amy Abernethy, Flatiron, Julia Adler-Milstein, U Mich, Chris Longhurst, Stanford, and Rob Merkel, IBM Watson Group. A very different group than the one at ISPOR, and very interesting to compare the approach and emphasis taken at both conferences in the same week. Electronic health records (EHRs) from past patients are a source of information, which reflects patient’s treatment choices and their effects as they happen in actual clinical practice. This source of information is readily available and can be queried at the point-of-care to aid in decision-making for individual patients. Real-time querying tailored to individual patients requires: EHR-based phenotyping; quantifying inter-patient similarity; optimal cohort selection; cohort visualization; automated confounder control and integrating results with clinical guidelines and existing evidence from clinical trials. Real-time querying also requires real-time validation, an important open area of research. While bias from measured confounders can be minimized using automated propensity scores techniques, bias from unknown or unmeasured confounders can still threaten the validity of results. Evaluating results from cohorts with known estimates can increase confidence in these methods. Results from point-of-care EHR-based cohort studies should not be looked at in isolation but be presented in the context of existing clinical guidelines and any available evidence from clinical trials. They are beginning to implement a learning health care system, and set a model for how this might be achieved in other settings.